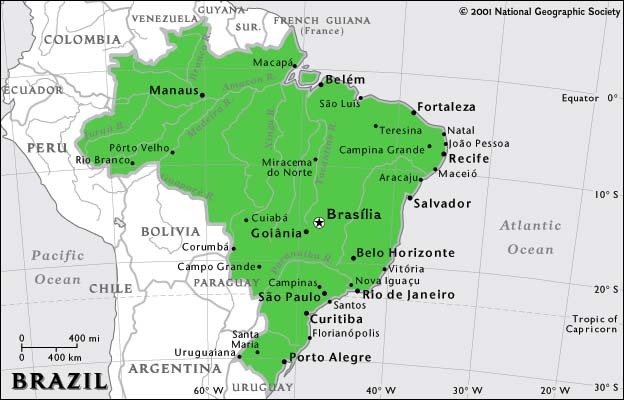 Brazil is slightly smaller than the United States and the biggest country in South America, and in size ranks fifth biggest in the world. It has by far the greatest proportion of the Amazon rainforest within its territory. Deforestation in the Amazon Basin is a major problem, destroying habitat and endangering numerous plant and animal species found nowhere else. This is a publicly availble map produced by the Central Intelligence Agency of the U.S. government. It shows the basic political features, such as frontiers and the main cities. There is a noticeable absence of major cities in the center of the country. National Geographic magazine produces maps with a particular look. These maps are produced as part of National Geographic's Xpeditions Atlas website.